I realize a review of the Virginia Tech game is being published on gameday against Wake Forest, but the short week is tough on us high paid sportswriters. I was surprised, in both positive and negative ways, that Clemson didn’t attack the middle of the field more. Coming into the game, there appeared to be ample room for receivers to roam free. But Clemson didn’t go after it. They tried a few times early, but it led to an awkward interception as Boyd consistently overthrew targets. You wondered if some easy throws over the middle might help Boyd find a rhythm, but maybe Clemson didn’t need to push the issue. There was decent success on passes along the sideline as Watkins caught a few passes and Hopkins hauled in a touchdown. But because of their early struggles, it’s hard to give this key anything better than “meh”. Virginia Tech rattled off a few big plays, including a 29 yard touchdown pass on their opening series and a Logan Thomas 19 yard scramble in the fourth quarter. But other than a few plays in the middle of the field, Clemson’s defense did a solid job of forcing VT to make plays and drive the ball. 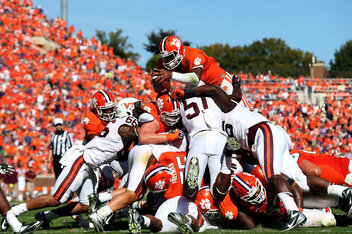 And it worked to Clemson’s advantage as Thomas threw two interceptions while a third was snagged on a trick play. Additionally, Clemson forced three fourth down attempts, stopping two. Virginia Tech is known for their special teams, for creating massive momentum swings during times of relative calm. The goal for Clemson was to not get beat on special teams. We don’t necessarily need to win the special teams battle, we just can’t lose. Clemson did much better than that. There were no major gaffes, Humphries looked solid returning kicks, and another field goal for Catanzaro. Oh yeah - they recovered a muffed punt, which set them up for their first touchdown and a lead they would not relinguish. What made Clemson's defense so successful last year was the presence of Branch along the defensive lines. He single-handedly wreaked havoc on Thomas and the VT offense. For Clemson to have similar success this year, they needed to create pressure and force Thomas into make poor decisions. Clemson only recorded two sacks, one of which is still being protested by Tech fans, but they were able to shut down the run game and force VT to throw the ball. And credit to Clemson for turning those passing situations into three turnovers. Clemson still gave up over 400 yards of offense and a few big plays, but the D-line made an appearance, something which they needed to do. The thought here was that Clemson does serious damage when starting possessions on the plus side of the field. Against VT, they had ample opportunities as the defense and special teams continually place the Clemson offense in great field position. Unfortunately, Clemson was unable to capitalize due to the offensive struggles. Hopefully, Clemson can shake those struggles and make future teams pay.